This photo comes from the Jay C. Hormel Nature Center in Austin, Minnesota (home of the Hormel Foods Corporation). I'd never have bothered to visit this place, except that it happens to be in Mower County, one of the two counties in Minnesota that had no Odonata records whatsoever. Actually, it's nice. I didn't see any particularly exciting species, but the fields were full of meadowhawks, and I've never seen so many spreadwing damselflies in one place. They may be the main ingredient in Spam. 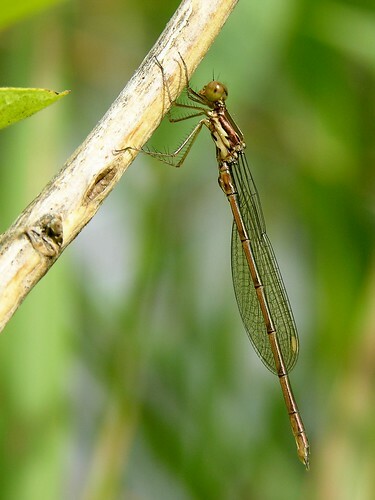 I thought this was a Spotted Spreadwing (Lestes congener), but the experts at Odonatacentral.org have neither accepted nor rejected the record so far. Maybe I was too optimistic -- young adult spreadwings are hard to identify. This one must have climbed out of his larval casing pretty recently, since he's not holding his wings out at an angle the way spreadwings usually do. He still looks shiny and new, as if he's made of bronze; he'll develop more dark markings later. If you look at the full size photo, notice the spines on his legs. Those are for catching bugs out of the air. 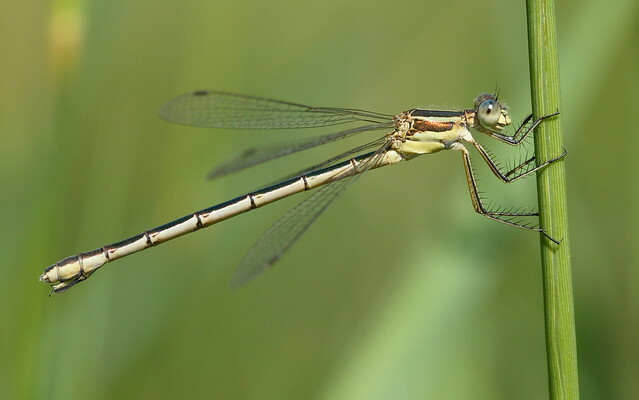 Damselflies look so delicate that it's easy to forget what effective predators they are.